Because of the pervasive influence of the Russian language in Azerbaijan, and because the Cyrillic alphabet has never fully expressed all the sound values for Azeri, so much confusion still exists in relation to spelling names from Azeri into English. Furthermore no standards have been established. That's why you'll often find two people with the same name spelling their names differently in English. Our staff at Azerbaijan International has been trying to deal with this problem for the past eight years as we try to produce consistency in spelling throughout the pages of our magazine. In an effort to promote standardization, we are identifying the general principles that we follow. Our primary concern is to write Azerbaijani names so that our readers can pronounce them as close as possible to the way they would spoken in Azeri. We follow these principles: =a, =ch, =gh, =i, c=j, x=kh, =o, =sh, and =u. 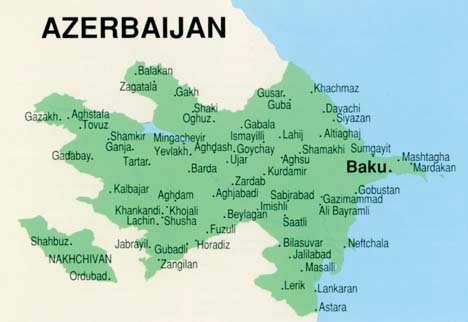 The major exception to this rule is the word, "Azerbaijan", which according to the rules set forth here should be spelled "Azarbaijan". However since "Azerbaijan" is so firmly established throughout the international community, it would be impossible to change it now.